HomeAim High Profits News HJOE | Can Hollywood Help Hangover Joe’s Get Up And Go? In one week, movie goers will get a chance to see the Wolfpack’s 3rd edition of the “Hangover” franchise which many are thinking will have a very positive impact on the penny stock of Hangover Joe’s Holding Corporation (HJOE). For months now, we have been strong advocates of having HJOE stock on the watch list in anticipation of opening night of The Hangover III. However, in what appears to be a scene out of their first movie when the former heavy weight champ does what he does best, some traders have lost a tooth biting into the shares despite over $1 million in 2012 sales being reported. Is their a cure for this hangover? Hangover Joe’s HJOE stock sprung onto the scene last year after reversing into Accredited Members Holding Corporation, a provider of investor research and management services. That move set the scene for what was clearly a real-deal beverage Company which has a tremendous story line to it as referenced in many of our prior articles about HJOE stock. Proof of the realness of Hangover Joe’s and their distribution deals for their Hangover recovery Shot were flowing from all 4 corners of the U.S. after we initiated coverage on it. Some said it was constantly sold out in their areas while others said it got them through their Monday after a long Sunday of NFL football barbecuing. The pudding was served a month ago when Hangover Joe’s filed their 10-K for the year ended December 31, 2012. Sales burst past $1 million, $1,079,234, compared to $279,961 for the same period the year prior. Gross profit was there as well as the expected loss from operations, $(2,138,604), that comes with getting a brand recognized in a market known to be extremely competitive. However, since the start of the year when HJOE stock ran for a few of the first trading sessions, it’s been more of a bust than a boom. On January 10, the Company struck a deal with TCA Global Credit Master Fund LP for up to a maximum borrowing of $6,000,000. Many who are familiar with toxic financiers like Asher Enterprises, TCA’s involvement with HJOE stock, regardless of the 3 year product license agreement extension with Warner Bros. Consumer Products, Inc., is not a good thing for those looking for a quick “get up and go” with the movie set to open in a week. The good news is that the movie will spark interest in the product (hopefully they found a way to slide it into a scene or two). Also, with this being the 3rd installment, trilogy DVD sets will likely be on the shelves at Wal-Mart this winter meaning more subliminal exposure for the product as well during the big drinking months. The bad news as we see it is that HJOE doesn’t look like it’s going to run to $1 any time soon. Hangover Joe’s Holding Corporation sells an all-natural, two-ounce beverage, formulated to help relieve the symptoms associated with alcohol induced hangovers – the Hangover Recovery Shot. Click here to view the SEC filings for HJOE. 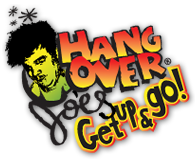 Click here to view the website for Hangover Joe’s. We love HJOE just like we love Soupman Inc.’s SOUP. Will HJOE stock be a good buy at $0.08? Sure, if you look at it as a long position or a small, double-digit flip with the movie hype, but it doesn’t look like it’s going to be the next beverage oriented penny stock that puts up quadruple digit gains like Bebida Beverage’s BBDA did last summer. Perhaps their delayed Q filing for the three months ended March 31, 2013 could be the spark needed to set this puppy on fire next week. WDKA | Can Panache Beverage Lure In Bacardi Money Again?